The total number of AIBs sold in 2015 was 50 million compared to 44 million in 2014. Of these, about 5.9 million are enthusiast level AIBs (add-in boards / discreet graphics cards) shipped in 2015 compared to 2.9 million in 2014. That rise in enthusiast AIB shipments, while the PC and overall AIB market was declining, was due to the great new games that were brought out in 2015. And, even though neither AMD or Nvidia introduced any killer new AIBs in 2015, sales went up. This is paramount proof that the enthusiasts and their followers want, and will pay for great games and hardware if it is compelling. The high-end gamer AIBs were the bright spot in the PC market in 2015, and especially in Q4'15. Overall add-in board market decreased in Q4'15, AMD gained market share, while Nvidia lost share. Quarter-to-quarter AIBs shipments decreased -4.9% and -7.9% year-to-year. Our estimated PC graphics add-in-board (AIB) shipments and suppliers' market share for Q4'15 is shown in the following table. JPR's AIB Report tracks computer add-in graphics boards, which carry discrete graphics chips. AIBs used in desktop PCs, workstations, servers, and other devices such as scientific instruments. They are sold directly to customers as aftermarket products, or are factory installed. In all cases, AIBs represent the higher end of the graphics industry using discrete chips and private high-speed memory, as compared to the integrated GPUs in CPUs that share slower system memory. The news was discouraging and not seasonally understandable, quarter-to-quarter, the AIB market decreased -4.9% (compared to the desktop PC market, which increased 2.0%). 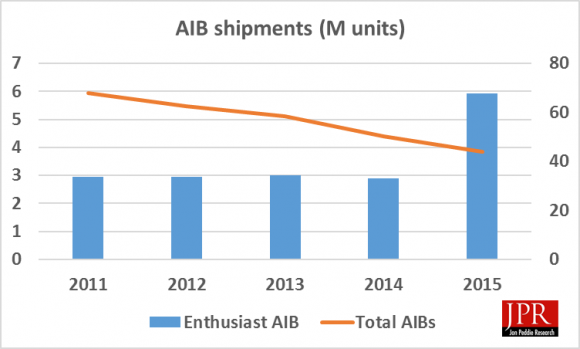 AIB shipments during the quarter decreased -4.9%, which is below the ten-year average, of 4.7%. On a year-to-year basis, we found that total AIB shipments during the quarter fell -7.9%, which is less than desktop PCs, which fell -10.37%. However, in spite of the overall decline, somewhat due to tablets and embedded graphics, the PC's gaming momentum continues to build and is the bright spot in the AIB market. The overall PC desktop market increased quarter-to-quarter including double-attach—the adding of a second (or third) AIB to a system with integrated processor graphics—and to a lesser extent, dual AIBs in performance desktop machines using either AMD's Crossfire or Nvidia's SLI technology. The attach rate of AIBs to desktop PCs has declined from a high of 63% in Q1 2008 to 37% this quarter. In addition to privately branded AIBs offered worldwide, about a dozen PC suppliers offer AIBs as part of a system, and/or as an option, and some that offer AIBs as separate aftermarket products. We have been tracking AIB shipments quarterly since 1987—the volume of those boards peaked in 1999, reaching 114 million units, in 2013 65 million shipped. This detailed 60-page report will provide you with all the data, analysis and insight you need to clearly understand where this technology is today and where it's headed. Jon Peddie Research's AIB Report is available now in both electronic and hard copy editions and sells for $1,500. Included with this report is an Excel workbook with the data used to create the charts, the charts themselves, and supplemental information. The annual subscription price for JPR's AIB Report is $4,000 and includes four quarterly issues. Full subscribers to JPR services receive TechWatch (the company's bi-weekly report) and are eligible for a 10% discount. Bundle packages are also available. For information about purchasing the AIB Report, please call 415/435-9368 or visit the Jon Peddie Research website at http://www.jonpeddie.com. JPR also publishes a series of reports on the PC Gaming Hardware Market, which covers system and accessories and looks at 31 countries. More information can be found here: http://www.jonpeddie.com/publications/pc_gaming_hardware_market_report/. Jon Peddie's Market Watch is a trademark of Jon Peddie Research. All other tradenames and trademarks referenced are the property of their respective owners.